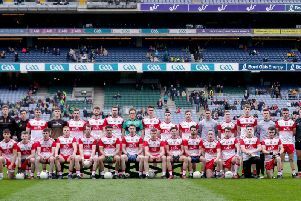 A lack lustre second half performance saw Derry opening their Allianz National Hurling League Division 2A campaign with a six point defeat to title favourites Antrim at Celtic Park. An impressive first 35 minutes had Derry five points at 1-08 to 0-06 but PJ O’Mullan’s Saffrons found their stride after the break with Conor Johnston and Eddie McCloskey superb as they came back to win with something to spare. With most pundits tipping the Saffrons to start with a comfortable win, Derry obviously hadn’t read the script and dominated the opening half with Ruairi Convery helping himself to six first half frees, one of which he sent over from his own ‘45. Indeed Convery got the scoring under way in the second minute with an 85m effort and doubled his side’s lead second later when he was brought down after threatening to get clear on goal. Antrim’s shooting by contrast was off target, Liam Watson sending two very scorable frees wide and Johnston also passing up a relatively straightforward chance before a Ciaran Clarke free finally got the visitors on the scoreboard in the 11th minute. They quickly levelled the game through James Black but Derry were well on control with a full back line who were sweeping up every ball in. Another Convery free edged Derry back in front before Gareth O’Kane found the net with some opportunistic forward play. There were 15 minutes on the clock when Alan Grant sent a lovely high ball in from wide out on the left touchline. The Na Magha’s man effort dropped short but Antrim keeper Chris O’Connell spilled the ball and the alert O’Kane was on hand to drill the rebound low into the net for a 1-03 to 0-02 lead. Antrim’s best player in the opening half McCloskey responded to level the score but Derry were controlling the game and deservedly took a 1-08 to 0-06 lead into the interval. Whatever was said in the visiting dressing room had the desired effect as the Saffrons upped the intensity considerably after the break. Johnston was at the heart of most things positive in the second 35 minutes and he got the ball rolling with an opening minute point which was followed by scores from McCloskey and Niall McKenna. Those scores reduced the deficit to two points and when Donal Nugent got his hurl up to flick a high centre into the Derry net, the momentum had swung totally in favour of the visitors. The Saffrons forged 1-18 to 1-11 ahead and seemed to be cruising until Convery slammed a 20m free into the net to gave Derry some hope. The Oak Leafers needed a couple of quick points to really turn the screw at that point but they never arrived. Instead, Antrim stepped things up again to ensure they would leave Celtic Park with the two points.